Later this month – in conjunction with Women United Network and Action Illinois, Women’s March Chicago – is planning a March to the Polls. Set for January 20, marches will take place in Chicago, Carbondale and Springfield and will be used to mark the first anniversary of the 2017 Women’s Marches. The idea behind this is publicity; it is hoped that once people are made aware of what’s going on, women will get more involved with the 2018 general and primary elections as well as future ones. Hopefully this will result in a larger turnout of women voters. 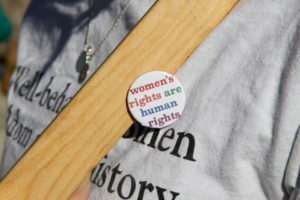 As well, the Women’s March fully promotes women’s rights, in particular: affordable childcare and healthcare; equal pay and rights; fair wages; freedom from violence and more. As it is, Illinois is already faring better than the rest of the nation. For the 2018 State House and Senate Primary Elections, the average female candidate percentage is a mere 36 percent. but in Illinois, female participation in Primary’s will reach 41 percent in 2018 – which is a new high as well as the largest amount of female candidates vying for those seats in the last three election cycles. However, even Illinois has a long way to go to bridge the gender gap. Since 2012 there has only ever been one year whereby more women ran in Republican Primary Elections for State House or State Senate than in Democratic Primary Elections. There were two increases however: one with the House of Representatives and one with lieutenant governor (three women competed for the position). At least it’s a start.